In an effort to champion responsible transportation and support smart urban growth in select markets, Brandywine Realty Trust has partnered with TransitScreen in Philadelphia, Pennsylvania to provide real-time, location-based public transportation availabilities prominently throughout the day. Multimodal updates from Indego (Bike Share), Uber, SEPTA, Amtrak, and the Brandywine Shuttle are showcased on a giant outdoor LED display and in building lobbies of Brandywine’s Trophy-class office towers. TransitScreen is a Washington-DC & San Francisco-based transportation technology company promoting sustainable urban mobility through access to real time information. 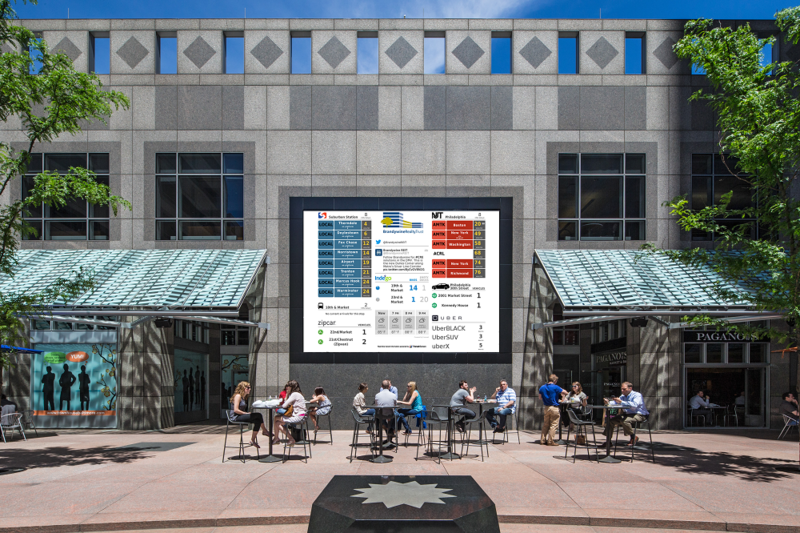 The displays are utilized as time- and cost-savings amenities in buildings and in public spaces while also offering a sustainable transportation demand management (TDM) mitigation tool for transit-oriented developments and large employers. Today, there are live displays in 18 cities across North America. Clients span various industries and geographies including commercial real estate, transit agencies, universities, hospitals, tech companies, smart cities, and nonprofits. “It’s always invigorating when working with a forward-minded company who simply gets it. Brandywine Realty Trust builds for the future, centering on increased transit awareness, efficiency, choices, and technology for their transit-oriented developments. Responsible business practices and sustainable initiatives such as this embody the company-wide commitment from the top-down. TransitScreen looks forward to supporting Brandywine in their efforts to be thought leaders in their core markets of Greater Philadelphia, Metropolitan Washington, DC, and Austin, TX,” said Jay Tedino, TransitScreen City Manager - NY & PHL Metro Areas. Brandywine’s TransitScreen displays are the first installations in the Philadelphia region. The transit data will be displayed at Commerce Square and Logan Square throughout the day and featured during peak times in the morning, lunch, and afternoon hours. “In a word: fantastic. Everyone in the vicinity now has information about all the transit choices featured on a large, outdoor screen, especially promoting the recently launched Indego bikeshare,” said Russell Meddin, Founder of Bike Share Philadelphia.